Far too often I see golfers consciously trying to swing down the line. This forces the hands out and necessitates a flip through impact. You can hit good shots with a flip, just not enough consecutive good ones to play well for all 18 holes. Here is a simple half swing I made with a seven iron using a ClubHub sensor that clearly shows how the handle (light blue line) tracks inwards (and upwards) during the impact interval. Get to the range, start with the small shots I demonstrated and I believe you’ll very quickly gain a sense of how this works to quiet the club face through that all important strike zone. Should you be interested in getting together for some work on your golf game click HERE. This may sound complex, but stand up and give this a try right now! It always amazes me when I do this how my hips rotate beautifully coming into the “strike”. Here is a before and after image of a student I worked with recently where all we focused on was the sequence of pressure movement under each foot. You’ll not only notice how much more his hips have rotated through impact, but also how much better the arms and club face are positioned. Give this a try the next time you head for the practice ground and let me know how things worked out. Thanks for your readership and support in 2018! I can promise more of the same quality of information for 2019. Have a Merry Christmas, Happy Holidays and may you be blessed in the New Year. Cheers! What are we looking for at impact? While generating speed can be genetic to a certain degree, our ability to control the club face at impact and thus the direction and shape of our shots is largely a product of both technique and skill. Merely posing impact, as I have demonstrated in the video above, might shed some light on what you need to work on in order to better control the strike and accuracy of your shots. You might be shocked at your results when you can start to master the trail side through the impact zone. Now let’s get to work. How can I get open? The great golfers pictured above have an uncanny knack at controlling the clubface through impact. I'm convinced that getting the hips and the chest more than less open as the club strikes the ball will help you to become a more consistent golfer. As I hit each of these shots I was floored at how much the ball moved in the air relative to the feel of the shot. The feel was neutral, yet the ball seemed to take off with a mind of it's own. I hope this information helps you save a stroke or two the next time you encounter the dreaded mud ball! If you haven't checked it out already you should jump over to Masters.com for all the news, updates and some incredible ANGC photography. Anything that's worthy of the Masters can be found there. I often conduct this demonstration for my Three Day Golf students where I hit back to back shots and attempt to illustrate the value of hitting up on the driver and what it could mean to their tee shots. For good measure I also throw in a little fade versus draw at the same time. Attack Angle - The 9.1º difference is the primary reason why the second shot traveled significantly further than the initial attempt. This was achieved with a change in tee height, address position and intent. Club Path - The almost 14º difference here will generally lead to a huge change in ball flight curvature. My findings have shown that when it comes to shot shape the club path plays a primary role. Launch Angle - The old adage of 'hit down to make the ball go up' takes a beating here as the shot hit with an ascending strike launches significantly higher. Club Speed - Nothing much to see here other than to verify that the club head for each shot is traveling at virtually identical speeds. Ball Speed - Another interesting nugget here is that while the carry and total distances are significantly different there is very little difference in the ball speed from shot to shot. Carry - Wow! That's amazing isn't it? While impact location for the second shot was slightly higher on the face (and a hint more toward the toe) which might lend to slightly longer carry distance the direction the club head was traveling (up and out) is the primary difference maker here. Total - As you might imagine the increase in total distance follows suit along with the increase in carry distance. Thanks for reading/watching. If you need hands-on help with your game I'd love to host you in Savannah at the Westin Savannah Harbor Resort for either a lesson or a Three Day Golf School. Email terri(at)andrewricegolf.com for details. The lead side separates as the player glides into their front side. This creates some leg separation. There should be a definite lowering or unweighting in the early downswing. The late downswing should be characterized by an upward thrust away from the ground. This is something that all long drivers take full advantage of - that ability to really thrust up from the ground and in most cases actually push both feet off the ground. It's that push that will help to really get the clubhead moving. Thanks for reading/watching and if you have a friend who would really benefit from this information please share it. When the idea for Coach Camp was hatched I wanted it to be something that made a significant change in the way coaches and professionals helped students improve, operated their business and marketed what they do. It has and always will be "Two days of industry leading coaching information designed to positively enhance the course of your career." The feature presenters in London will be coaching legend Chuck Cook, putting guru David Orr, biomechanics expert Scott Cowx and myself. We will also have Dr. Scott Lynn share his presentation on ground reaction forces. There will be live lessons, Q&A sessions, putting demonstrations and perhaps best of all - the cocktail party on Monday evening where we can get down to the nitty gritty questions you might have. 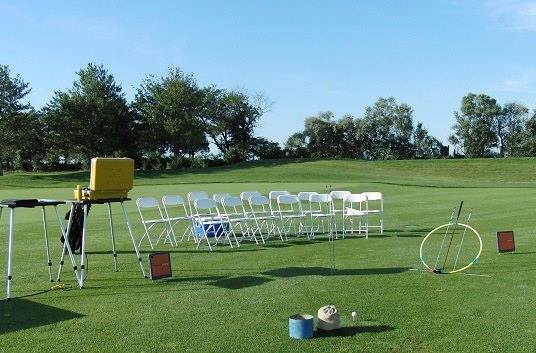 All so that you can be more successful on the lesson tee! We will be at the Drift Golf Club in East Horsley outside London on September 25 & 26. Our title sponsors: KVEST3D; Swing Catalyst; TrackMan; and True Spec Golf will also have representatives on site. Not only will you be able to see this technology in action, but the company representatives will be able to answer any questions you might have. I hope you take advantage of this opportunity to learn from some of the best in our business. I have often believed that a round of golf should be interesting, enjoyable and challenging at the same time. This compilation of holes are exactly that! Every hole on the list is one that a golfer would eagerly anticipate. The excitement of a possible birdie perfectly balanced with potential for disaster. The truly amazing fact about this 'golf course' is that it would only measure 5882 yards in total! There are not many of those of us who call ourselves golfers who'd be caught dead teeing it up from the 5900 yard markers. Now I'm sure some of the par 5's on the list could be stretched a little longer than what I have them listed at, but the fun part is being tempted by these great holes - and if they're any longer I simply couldn't be tempted. We all need skills. Hopefully wicked skills! By giving yourself ONE opportunity to hit each of the shots required to complete this drill you are continuously challenging your ability to adapt to the requirements of each unique situation. Something real golf requires on every shot! The seven required shots are a big slice, a medium fade, a baby fade, a straight one, a baby draw, a medium draw and a big hook. Don't hit them in order, but mix it up. Real golf doesn't work in a neat and smooth progression - neither should your practice. Keep a score too. It will help you strive to achieve full marks! Give this drill a try the next time you go out to practice. In fact, any skill based challenge or drill you can come up with will help you to develop wicked golf skills that you can take out on the course with you to start shooting lower scores.